The first troop we started the Clash of Clans game with is the barbarian, although as time goes by and as we move forward we will be able to unblock other troops, we will be putting it aside a little bit, which is a pity, but unfortunately it is so. A Clash of Clans barbarian is very strong and has great resistance to hits, at the beginning of the game we are taught how to use it and the best strategy in using them in groups. Previously, making this type of troop took 25 seconds, however, thanks to the latest updates you can create one of them in just 5 seconds. When we start in Clash of Clans, or when we are still beginners, the best thing to do is to set selective targets, that is, at first we must attack villages without walls; we select archery towers, mortars and cannons, destroy them and then we can enjoy the loot. The best strategy to achieve this is to separate the troops to attack each of the targets, one group attacks the mortars, another the cannons and a third the archery towers. If it is done in this way, you run the risk of the barbarians that make up our troop attack the first thing they see, because they do not have a favorite target, so they attack everything they find in their path, which can be quite damaging and cause us to lose the battle. Barbarians are the figure we have at the beginning of the game, although their standard of living is low, it is enough to achieve victory in many battles at the basic level. To raise the level of this type of troop is not so expensive, it costs more to get the laboratory, because for this you must raise the city council to level 3, and then create it. It is also necessary to increase the elixir’s storage capacity to 25,000. At these levels, barbarians possess a higher level of aggressiveness and can be employed without any fear of being easily destroyed. They are more resilient than previous levels, making them ideal for effectively attacking a village level 20-45. The only difference from its predecessors is the ribbon in the hair. At this level the barbarian is a better fighter, he has become an ideal troop for battles against villages between 45 and 65 levels. On level 5 the general appearance of the barbarian changes a little, he has a helmet with horns and his sword is now bronze. 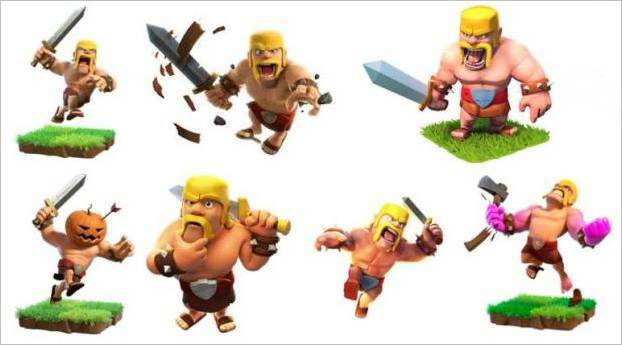 Level 6 is the ideal level for this type of troop, as going up a barbarian to level 7 is quite a high cost in relation to the advantages that can be achieved with it. At this level, it appears with a black helmet with the horns crooked downwards, the buckle that in the previous level was blue now turns golden, the sword becomes dark grey and the skewers and bracelet have become golden. This is the highest level of the barbarians; at this level they suffer again very noticeable physical changes, in the helmet the horns are now golden and their sword has a burning edge, the spikes of the bracelet are now golden. We’ve seen the first troop we have at Clash of Clans evolve. Barbarians usually have special affection and are ideal together with archers to make farming, because they take very little time to be created and their cost is not very high. Although they tend to be little used in wars, in common battles they are very useful to distract enemy defenses. It is recommended to use them together with the giants, as they have great resistance in combat. They are also not advised to be used in the defence of a village, as we have commented on previous occasions that it is recommended to attack with troops who can do so from a distance and the barbarians are very vulnerable to these attacks. One of the most effective ways to do harm with the barbarians, besides throwing them into a large group, is to place them in strategic areas of the attacked village, in several targets at once. This will distract enemy troops, who will be forced to attack several fronts, so we can target and do a lot of damage. The worst enemy of the barbarians is mortars, as this weapon has evolved to cause great damage to this type of troop, especially if it is in a group. One barbarian can endure an explosion, but two are too difficult to achieve; because they are ground troops, they are also affected by jump traps and hidden bombs. We don’t want to leave without first showing you a video in which the great General Tony talks about the barbarians and what strategy to carry out with them. Learn as much as you can! What did you think of CoC’s barbarians? Fascinating, aren’t they? They are one of Clash of Clans’ favorite troops and one that we players enjoy the most.